Its been absolute ages since I've written a traditional MFM post, so I hope you'll enjoy this catch up and outlook on my week. Let's dive straight into the new week... I browsed the Coloursnme blog to get inspired and organised. 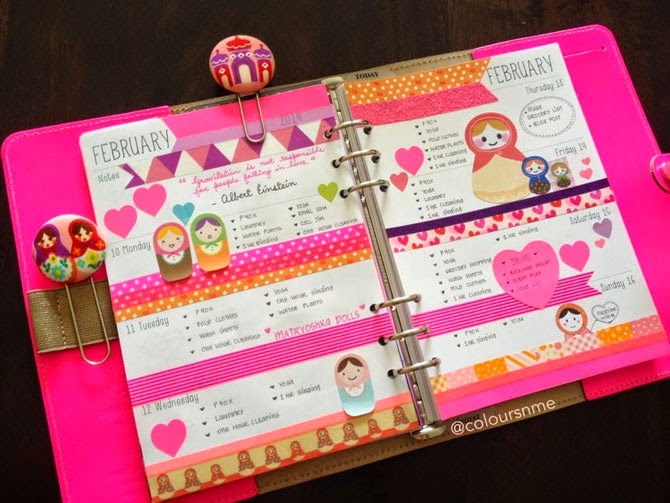 The beautiful photos and pretty pages in Malini's planner did the trick. Last week was a really good work week. I'm not sure why, but it felt as if I got my 'groove back', corny as that may sound. It was great to get back to blogging too. Have you spotted a few changes around here? Claire and I are still working on a one or two updates, but watch this space! This week is fully booked as far as consulting sessions go. I have several in person and a few online ones too. The sessions are one of my favourite aspects of my work. I'm also catching up with Sabrina from Fashion Nanny, who is back from London and Rome. I can't wait to hear what she saw and experienced. We'll be planning a few updates for her business and chatting through next week's Fashion Camp, where I will be speaking about blogging and social media. I'm excited to add the finishing touches to the blog. There are also loads of social things on the go, after work I'll be heading out for good meals and catch-ups. I'm looking forward to dinner at Lupa Osteria and Lauren from Glossary's birthday party on Saturday. Staying focused! I've been steadily setting into a new and improved routine and I would like to keep up the momentum. I currently feel as if I'm consolidating life, both work wise and on a personal note. I want to get things done and find balance as always. I'm feeling positive and happy - ready to face the last few months of the year. Yikes... it's a bit scary how fast we are heading towards Christmas! Wishing you luck for your week! Let me know what you're up to or looking forward to this week? Be sure to check in for other posts this week as well as next week's MFM planning edition post. Thank you so much for featuring my blog in your's. The planner page you have picked is one of my all time favourites too :). I am glad that my pages inspired you. I love reading your MFM posts! Great and inspiring!